In the OEA baseline outlook, housing starts and construction activity are expected to come back to life around a year from now. Developers are forward looking, and will not wait for house prices to improve before getting back to business. Even so, the February reading of the National Association of Home Builders/Wells Fargo Housing Market Index (HMI) appears too good to be true. The HMI combines current single-family housing sales with measures of buyer traffic and expectations for sales six months into the future. For the West region, builder confidence has surged ahead to a reading higher than anything seen since the housing boom. 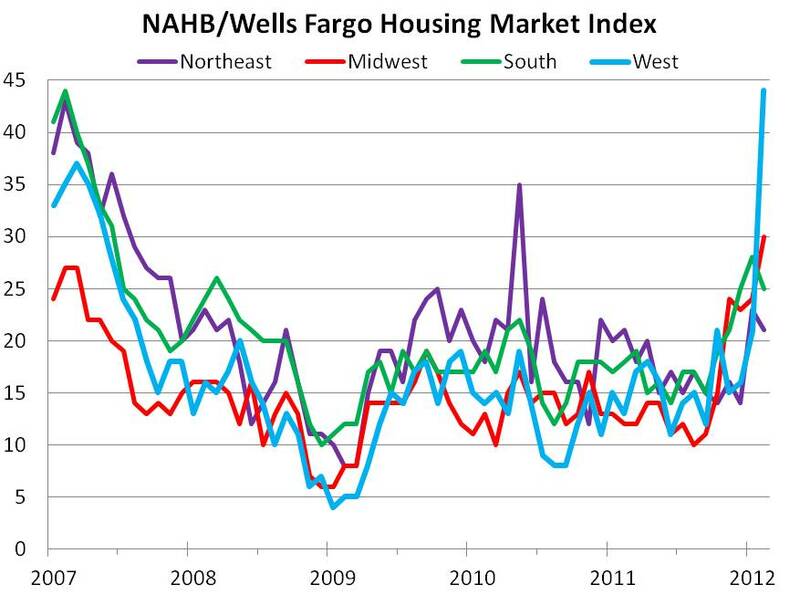 Although this jump in the regional HMI overstates the case, builder confidence is improving. With the nationwide employment picture looking better, and foreclosure mitigation policies being nailed down, there is finally some light at the end of the tunnel for single-family builders. Note: The index is constructed such that any number below 50 indicates more builders view sales conditions as poor than good. The last reading above 50 at the regional or national level was the summer of 2006. I have mixed feelings on this. I know that an uptick in home building is good for the economy. But as a homeowner who has seen his home value dive well under my mortgage balance, I cringe at the thought of additional housing supply.